Great for uneven surfaces and outdoor work. 4" x 1" mold-on-rubber swivel casters are located at the back of the cart to stabilize loads and prevent tipping. The back casters will also transform the unit into a horizontal platform truck. 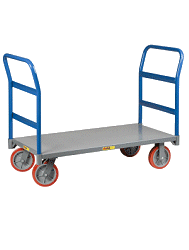 The unit will lie back horizontally, the handle will release to a standard position, and now the cart is a platform truck. 10" x 3½" pneumatic casters. Ships knockdown.